So where are the yellow bellied sap suckers? Remember that line from old cowboy movies and shows? Great memories from kid hood are the summers we spent in the Rockies. Now that I'm in a second edition of kid hood, I can't get enough of the Sierra. The timeless architecture and vast expanse of the mountains tend to open my mind similarly. In earlier life I was on the board of the President Benjamin Harrison Home in Indianapolis. I took pride that Harrison was the President who signed Yosemite National Park into existence. I always reflect on that when wandering the through the Sierras. 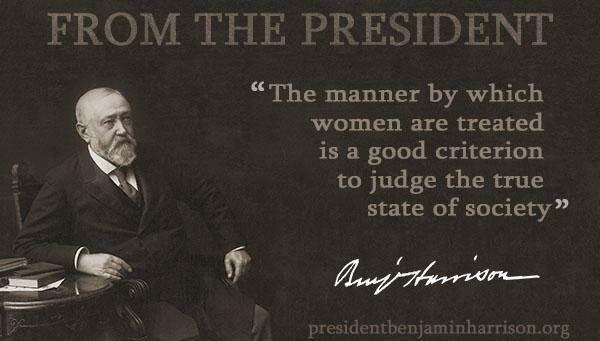 Cultural norms were vastly different from 1889 to 1893 when Harrison was President, which only underscores the historic and contemporary importance of what he said. This point alone demonstrates how far Republican Presidential values have plummeted under the current occupant. Millions of US citizens await the fall of this president who seems to become more atrocious by the hour. The majority of voters did not want him, but there is still the almost unbelievable support of those who voted for him. It is as if there is nothing that will dissuade them. I share here a letter I penned to the editor of the local paper. As noted, it seems to encapsulate this matter of trumpistas. The Letter to the Editor section on Thursday, October 26 (Opera SLO-an accusation and a response) is a perfect capture, in microcosm, of the "roots" of the divide and rancor threatening America today. Elise Cassel and Juan Hovey of Santa Maria talked about being "...stunned-appalled" to see a character in Madame Butterfly drag an American flag across the stage floor. The writers then castigated Opera San Luis for a willingness to "exploit" and "make gratuitous and contemporary political statement." That's venomous enough but they said they would end financial support. What followed was an eloquent response from Brian Asher Alhadeff of Opera San Luis explaining the scene was part of the story and script dating to 1898 and was how Giacomo Puccini staged it beginning in 1904. It is American to express points of view, but it is intelligent to speak with a sense of knowledge, history, context and understanding. Sadly this is an age when people are full of self righteous indignation and opinions which are not grounded in fact or truth. Still they spew. They even vote motivated by anger and ignorance. I hope Mr. Alhadeff's detailed analysis and kind and sympathetic response to those who feel aggrieved may assuage their bitterness and hair trigger response. His letter is an example of how to respond to those who are judgmental, without knowing of what they speak. Taken in a larger context, that is to include the White House and those who support the present occupant, it is a lesson of how to relate to the self righteous, narrow minded and bigoted who are bereft of intelligence, reasoning, knowledge of history or logic. While the accusations of the writers are symbolic of what is epidemic in the US, being as intolerant in response will not dissuade "true believers." The way out of the deadlock just might be a demonstration of kindness laced with genuine knowledge. I hope the writers will reconsider their support for Opera SLO. Well, we can hope, right? How do the angry letter writers feel about exploitation of the flag by commercial businesses. Our local Toyota store has 70 flags, every night flag protocol is violated when they shut off the lights. Do I need to show respect for the flag when entering a "patriotic" business...pause salute, put my hand over my heart? Please keep us informed as to whether or not your words have any impact. This is about as absurd as banning Huck Finn because it includes the "N" word. We whitewash history at our own peril. IT'S ASKING A GREAT DEAL OF PEOPLE TO ACTUALLY THINK BEFORE THEY SHOOT.